Here’s the place to find helpful information on the Church Fathers featured in the AFFN’s Chapel. For the bibliography consulted, try our Chapel Sources page. A mbrose (c. 339-397). Ambrose was the first Latin Church Father born into a Christian family. He devoted himself to studying the law and was rewarded by being appointed governor of the northern section of Italy in 370. Four years later, the people of Milan appointed him as bishop of their city. Ambrose faced down emperors while teaching the truths of Jesus on a weekly basis to the people. He did much to advance congregational singing, was instrumental in bringing a young Augustine to Jesus, and composed an influential book on Christian ethics—On the Duties of the Church’s Servants. Other key writings of Ambrose include On the Holy Spirit, On the Incarnation, and On the Faith. Aphrahat (early fourth century). The author of Demonstrations, a series of works in Syriac detailing fundamental aspects of the Christian faith, was unknown for two centuries following their translation. Today, scholars have determined that the author was Aphrahat, known as the “Persian Sage.” Almost nothing is known of Aphrahat’s life, except that he was a Christian theologian and possibly a bishop. Medieval tradition made him head of a monastery in Mar Mathai, near the city of Nineveh. Athanasius (c. 295-373). Born in Alexandria, Egypt, Athanasius received a primarily Christian education. In 328, he was selected to be bishop of Alexandria, where he began a crusade against the Arian belief that the Son was a created being. Athanasius countered this heretical belief by insisting that if that was the case, Christ could not save people from their sins. His writings and teachings caused him to be exiled five times by four different rulers, but his home church accepted him with open arms each time he returned. His most important works include The Three Orations Against the Arians, On the Incarnation, and The Life of Antony, which promoted monasticism for future generations. Augustine (354-430). Augustine is considered by many to be the most important church father, and is likely the most widely known due to his Confessions, a personal account of his conversion to Christianity. He was born in North Africa to a pagan father and a Christian mother. As a young adult, he was a follower of Greek pagan teachings. But he was moved by sermons of Ambrose, and he was later prompted by a voice to read Romans 13:13-14, which brought him to a saving faith. Augustine then adopted a very simple lifestyle, selling all his posses­sions and devoting his gifts to Jesus. He was appointed presbyter to the church in Hippo in 391 and made bishop four years later. Augustine became the spiritual leader of the Western church and his teachings can be found in his numerous treatises, sermons, and The City of God, writ­ten in response to the sack of Rome in 410. Basil (c. 330-379). Born into the family that included Gregory of Nyssa, Basil received an excellent rhetorical education and later became a powerful influence on the church in Caesarea in Cappadocia. At school, he became good friends with Gregory Nazianzen and later taught rhetoric in Athens. Influenced by his sister Macrina, he became a monk and started a monastery at his family residence. Later in life Basil became a presbyter and finally the bishop in the church of Caesarea. Despite the persecution of Emperor Valens, he remained steadfastly loyal to his Lord. His greatest works include the Hexaemeron, a series of lectures on the beginning chapters of Genesis, and a treatise entitled On the Holy Spirit. Clement of Alexandria (c. 155-c. 220). Clement was a philosopher and became a Christian through his studies. Little is known of his early life except that he traveled in Greece, Italy, and Syria in quest of learning. Seeking the best teachers in the world, he came to Alexandria where he studied under Pantaenus and received vast amounts of Scriptural knowledge. In 190, Clement succeeded Pantaenus as head of the developing school of Alexandria and taught there until 202. His writings focused on Christian morality (The Exhortation), drawing pagans to the Christian faith (The Instructor), and the creation of a Christian philosophy based on faith in Jesus (Miscellanies). Commodianus (third century). Little is known about Commodianus. Scholars have placed him variously in the third and fifth centuries and in different parts of the empire. In his Latin poem known as Instructions, he defends the Christian faith against pagan gods such as Saturn, Jupiter, and Hercules and addresses moral precepts to Christians of all stations. 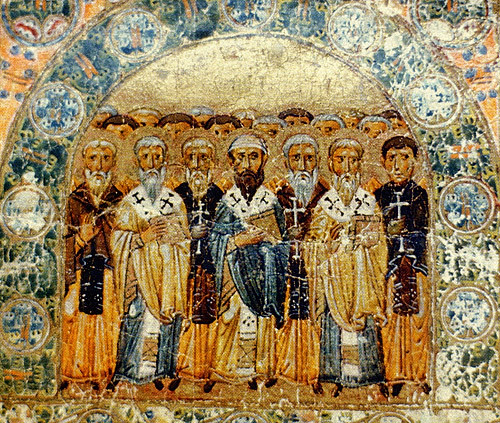 Constitutions of the Holy Apostles (third-fourth centuries). This eight-book compilation in Greek was made by an unknown author who drew upon earlier Syrian documents and the writings of Hippolytus of Rome (c. 170-c. 236). Cyprian (c. 200-258). Little is known about the early years of Cyprian except that he was educated for the purpose of becoming a rhetorician. After spending time with Caecilius, a presbyter in the church in Carthage, he professed faith in Jesus in 246. From there, he devoted himself to studying the Scriptures and was made bishop of Carthage two years later. During the persecution by Decius in 250-251, Cyprian hid in a place near the city and led the church from there. He later imposed strict conditions for those who had “lapsed” (denied Christ under threats of death) to reenter the church. Circumstances later moved him to greater leniency. Cyprian also played a role in a controversy over the validity of baptism by heretics with Stephen, bishop of Rome, that ended when Stephen died in 257. The next year, Cyprian was exiled and beheaded. His works are primarily concerned with the administration of the church. Cyril of Jerusalem (c. 310-386). Nothing is known about the early years of Cyril. He was ordained as a presbyter at Jerusalem by 343. Around 348, Cyril was appointed bishop of Jerusalem, a position which he held despite attacks by leaders of other sects and three separate exiles. His most important contribution to Christian literature is his Catechetical Lectures for people desiring to join the church. His messages focused on the importance of Jesus’ death and resurrection as the cornerstone of the Christian faith. Dionysius of Alexandria (200-c. 264). Dionysius may have come from a wealthy family; in any event he was clearly well educated. Eusebius says that he studied under Origen and became head of the Alexandrian catechetical school. Dionysius assumed the role of bishop of Alexandria in 246 but found his reign to be tumultuous. The persecution of Emperor Decius and a number of controversies within church walls caused him much anguish. None of his writings survive intact; however, Athanasius and Eusebius have large fragments included in their works. Ephraim Syrus (died 373). Ephraim (also spelled “Ephrem” or “Ephraem”) was born in the city of Nisibis during the reign of Constantine to Christian parents. After his city was ceded to the Persians in 363, he moved to Edessa, where he lived his remaining years as a teacher and a defender of the Christian faith. Ephraim’s hymns and versified homilies (in Syriac) establish his reputation as the greatest early Christian poet. He also wrote commentaries on biblical books. Eusebius of Caesarea (c. 260-c. 340). Eusebius is commonly known as the “Father of Church History.” Little is known of his early life, but it is assumed he was born in Syria and received an education in both secular and Christian philosophy. Eusebius later became an assistant to his teacher Pamphilus in Caesarea, admiring him so much he called himself Eusebius Pamphili. After the persecution of Diocletian in 303-313, Eusebius was elected bishop of Caesarea, which he held until 325 when his rebuke of Bishop Alexander over Arius (leader of a sect) led to his excommunication. He was restored later that year at the Council of Nicea, where he presented a creed that was accepted by the assembled bishops, but afterward he resumed his opposition to the opponents of Arianism. His writings cover various aspects of the Christian faith, the most notable being his Church History. Gregory I (540-604). Gregory was born into a godly family of considerable influence in Rome. After the death of his father, he proceeded to set up seven monasteries, of one of which he became abbot. Gregory wasn’t allowed to stay for long; the pope called him to be one of the seven deacons of Rome and subsequently sent him to Constantinople to be a representative at the imperial court. In 590, after the death of the pope, he was called to take his place. Gregory called himself “servant of the servants of God,” a title every pope has used since. His most important writings are the Pastoral Rule, a handbook for bishops; numerous teachings, letters, dialogues; and the Exposition of Job. Gregory Nazianzen (c. 330-389). Gregory grew up in a wealthy and religious Christian household. His father was bishop of Nazianzus, and his mother helped raise him in the knowledge of the Lord. Gregory studied in most of the major centers of learning in the eastern part of the empire before being baptized in 358 and undertaking to live a monastic life. His father forced him to accept ordination as a presbyter in 361, but ten years later his friend Basil’s attempt to force him to accept ordination as bishop failed. He finally agreed to accept responsibility for the orthodox church in Constantinople in 379, where he served for two years before resigning under fire from various opponents. His poetry, letters, and orations establish his reputation as a writer, orator, and theologian with few peers in the early centuries of Christian history. Along with Basil of Caesarea and Gregory of Nyssa (the other two “Cappadocian fathers”), he played an important role in the shaping of orthodox Trinitarian and Christological doctrine. Gregory of Nyssa (330-c. 395). Gregory was born in the city of Caesarea near the middle of the fourth century. He was given a comprehensive education by his brother Basil and his sister Macrina. His first profession of the Christian faith came from a vision in which the martyrs of the church appeared to him, chided him for his indifference to the faith, and beat him with rods. Gregory became a rhetorician but in 371 was forced by his brother to become bishop of Nyssa, where he remained until removed in 376. His most important contribution to the Christian faith is the twelve-book Against Eunomius (an Arian), in addition to his treatises on such doctrines as the Trinity, the Resurrection, and Jesus’ baptism. Hermas (first or second century). This is the name used by the author of the Shepherd of Hermas, a writing used by some early Christians alongside the books of the New Testament. In modem times Hermas has been treated as one of the Apostolic Fathers. One ancient document identifies Hermas as the brother of Pius, a bishop of Rome who died around 154, but at least some portions of the Shepherd seem to have been written around six decades earlier. The Shepherd consists of five Visions, twelve Mandates or Commandments, and ten Similitudes. Its central theme is the problem of repentance. Hilary of Poitiers (c. 315-367). Hilary of Poitiers is best known for his stands against the Arian sect in his two treatises, On the Trinity and On the Synods. His early years were devoted to the study of pagan philosophy and rhetoric before he was converted to the Christian faith. Around 350, he was appointed as bishop of Poitiers despite having a wife. His six years as bishop were spent refuting the Arians and upholding the teachings of Athanasius. Under the Emperor Constantius II he was banished to Phrygia in Asia Minor, where he composed his treatises. Hilary returned to Poitiers and spent the rest of his life defending the Christian faith from heretical teachings. Ignatius of Antioch (died c. 120). Ignatius was bishop of Antioch. He was arrested under the Emperor Trajan and sent to Rome for trial. Along the way, he wrote seven letters to various churches in which he expressed his desire to suffer martyrdom for Christ. In these letters he also argued that each congregation should have one particular leader (the bishop) in order to ensure unity in doctrine and church life. Polycarp, who collected his letters, had no firm information about what happened to him at Rome but assumed that he was in fact martyred. His letters are included in the Apostolic Fathers. Irenaeus (c. 115-c. 202). Irenaeus was born at Smyrna, in Asia Minor, where he learned Johannine theology from Bishop Polycarp. He seems to have lived for a time at Rome before settling by 177 in Lyons, where he succeeded Pothinus as bishop of a Greek-speaking Christian community. His major writing, Against Heresies, describes and refutes the teachings of Gnostics, who deemed to have secret teachings unknown to most Christians. Irenaeus replies that the four Gospels, especially as interpreted by the bishops who succeeded the apostles in major cities such as Rome, constitute a valid and public witness to Christ, who, as Paul taught, “sums up all things.” Secret traditions and private revelations are to be rejected. His influence on later theologians has gained him recognition as the first great theologian of the post-biblical universal church. Jerome (c. 345-c. 419). Jerome was born at Stridon, near the Adriatic Sea, and acquired an education in Rome due to his wealthy parents. It is believed that he became a Christian after going with a group of friends to visit the tombs of the martyrs (around 366). In 374, Jerome had a vision in which he was rebuked him for following Cicero and not Jesus. That sparked a devotion to the study of the Bible for Jerome. He later met Gregory Nazianzen and became secretary for Pope Damascus, who commissioned him to create the Vulgate, a new Latin translation of the Scriptures. After Damascus died he lived a monastic life at Bethlehem, devoting his energies to translating and writing biblical commentaries. John Cassian (c. 360—c. 432). Little is known about John Cassian’s early life. He spent a decade in a monastery in Bethlehem. Cassian and a friend wanted to learn more about the monastic life, so they went to Egypt and received expert teaching from the monks there. John Chrysostom ordained him a deacon in Constantinople, later sending him to Rome with a letter to Pope Innocent I describing the harsh persecutions occurring there. Cassian eventually settled in Marseilles, where he set up two monasteries and wrote his three most influential works: The Institutes, The Conferences, and On the Incarnation against Nestorius. John Chrysostom (c. 347-407). Known as the “Golden Mouth” for the eloquence of his sermons, Chrysostom was born in Antioch and raised by his mother, who at twenty had become a widow. He became a monk and later was appointed deacon (381) and priest (386) in Antioch. His reputation as a preacher increased, and in 398, Chrysostom was appointed, against his will, to be bishop of Constantinople. His sermons led the city through many crises, but his enemies eventually convinced the emperor to exile him on three occasions, and he died in exile. Chrysostom’s sermons and commentaries on the Bible have led many to consider him the second greatest church father after Augustine. John of Damascus (c. 675-749). John is considered one of the last great fathers of the Greek Church. He was born in Damascus to a wealthy family and for a time represented Christians in the court of the caliphs. A few years later he became a monk, living in Jerusalem. John’s most famous work is The Fountain of Knowledge, a three section treatise against the sects of the fifth and sixth centuries. His teachings and writings became the framework for the Greek Orthodox Church of today. Justin Martyr (c. 100-165). Born in Samaria, Justin Martyr studied in the schools of the philosophers, becoming a disciple of Socrates and Plato. He was impressed that Christians did not fear death, and after a conversation with an elderly Christian, he became a Christian. Justin Martyr is known as one of the first Christian apologists (defenders of the faith). His first, Apology was addressed to Emperor Pius and explained the falsity of common slurs on Christian morality. His Dialogue with Trypho, portrayed a debate between Jewish and Christian ideas. His life was cut short in 165 in Rome when Marcus Aurelius martyred him for his beliefs. Lactantius (c. 240-c. 320). Lactantius’s writings have such a style and grace about them that he has been called the Christian Cicero. It is assumed he was a native of Africa, where he attained prominence as a teacher of rhetoric. Diocletian invited him to live in Nicomedia and teach, but he had such a difficult time there that he focused on composition. He became a Christian late in life and was hired by Emperor Constantine to teach his son Crispus. Lactantius’s writings defend the Christian faith and refute prevailing heresies. Leo I (died 461). Leo, known as “the Great,” was elected bishop of Rome in 440. During a time when the Western Roman Empire was crumbling under barbarian assaults, he managed to consolidate the power of the papacy, claiming authority as successor of Peter over churches not in Italy but throughout the West. As a theologian, he was not an original thinker, but his Tome, a position paper that he sent to the Council of Chalcedon in 451, summed up church doctrine about Christ in a way that effectively ended debate on that topic in the west. Many of his letters and sermons are extant. Melito (second century). Melito was bishop of Sardis in the last third of the second century. His homily On the Pascha (i.e., on Easter), discovered and published in 1940, shows that he used a flowery rhetorical style. He is the first writer we know of to refer to the Hebrew Bible as the Old Testament; his theology features Christ as the fulfillment of Old Testament precursors. The Syriac fragments given under Melito’s name in the Ante-Nicene Fathers, including the Discourse in the Presence of Antoninus Caesar, are probably spurious. Minucius Felix (third century?). The writings of Jerome suggest that Minucius Felix was an advocate in Rome before he was converted to the Christian faith. Nothing else is known with certainty about him. His only surviving work is the Octavius, an argument between a Christian and a pagan which Minucius Felix mediated. Origen (c. 185-c. 251). Origen was one of the most scholarly and prolific writers of the early church. He was born to Christian parents in Alexandria, a major center of learning. His father was martyred in 201. While still in his twenties he instructed new converts to Christianity while pursuing his studies in philosophy. Disagreements with the bishop of Alexandria eventually forced him to relocate to Caesarea; the bishops of Caesarea and Jerusalem were more appreciative of his contributions. He died as a martyr for the faith but has remained controversial throughout church history, largely because of the way in which fifth-century heretics developed certain ideas which he had set forth in a cautious and tentative way before the development of church doctrine ruled them out. No other Christian before the modern era matched his abilities in linguistic and textual scholarship, which bore fruit in approximately two thousand written works, including many sermons and commentaries on biblical books, in which he derives a spiritual meaning hidden within the literal text of Scripture. He also produced a massive edition of the Old Testament called the Hexapla (now extant only in fragments) that compared various Greek translations with the Hebrew text. His other writings include an apology Against Celsus, which refutes pagan attacks on Christianity, and On First Principles, a systematic exposition of his own theological views. Rufinus (c. 345-410). Rufinus was born at Concordia (in Italy) and studied at Rome, where he met Jerome. He subsequently lived for a time in an ascetic community in Italy before moving to Egypt and later to a monastery near Jerusalem. His major literary work was the translation of Greek writings, especially those of Origen, into Latin in a period when the knowledge of the Greek language was declining in the west. His former friend Jerome harshly attacked the quality of his translations, but modern scholars believe that they are essentially reliable. Among his original works, his Commentary on the Apostles’ Creed is somewhat dependent on the writings of Cyril of Jerusalem. Sulpitius Severus (c. 363-c. 420). Sulpitius (or Sulpicius) Severus was born in Aquitania to a distinguished family and began the career of a lawyer. After the sudden death of his wife, however, he became an ascetic. His hero, the former soldier turned miracle-working monk and bishop, Martin of Tours, is the subject of his Life of St. Martin, a literary masterpiece that became a model for many medieval lives of saints. Tertullian (late second-early third century).Tertullian was a native of Carthage in North Africa. His writings imply that he was raised as a pagan and subsequently converted to Christianity and became a presbyter. He was evidently married, since treatises To His Wife are included among his writings. He appears to have embraced Montanism (a charismatic and morally rigorous sect of Christianity) by around 205, but it is not known whether he definitively separated from the catholic church at Carthage. His numerous writings constitute the first major body of Christian literature in Latin. In them he defends Christianity against paganism, expounds Christian doctrine over against Gnosticism and other heresies, especially Marcionism, and discusses issues in Christian ethics. Testaments of the Twelve Patriarchs (late second century?). This work claims to present the last words of each of the twelve sons of Jacob. Each son gives moral exhortation based on passages in Genesis or on later Jewish tradition about the patriarchs. These exhortations were obviously not composed by the patriarchs themselves. They may have been composed by a Christian writer sometime around 200, since they contain a number of obviously Christian passages, but many scholars believe that they were written by a Jew in the Maccabean period and later adapted by a Christian editor. Theodoret (c. 393-c. 460). Theodoret was born in Antioch to a wealthy family and educated by monks. After the death of his parents, he sold all his possessions and entered a monastery. In 423 he was elected bishop of the nearby town of Cyrus. As a theologian, he is notable primarily for his advocacy of a two-natures Christology. His opposition to the powerful bishop Cyril of Alexandria, whose theology Theodoret regarded as implicitly monophysite, led to his exile. He was restored by the Council of Chalcedon in 451, but a century later his writings against Cyril were condemned by another council. His surviving writings include biblical commentaries, A History of the Monks of Syria, a church history covering the period from 323 to 428, and around 200 letters. Theonas (late third century). Little is known about Theonas except that he was bishop of Alexandria from 281/2 to around 300. Scholars consider the Epistle to Lucianus to be spurious. Theophilus (second century). Theophilus was born near the Tigris and Euphrates Rivers and converted to Christianity as an adult. He became bishop of Antioch late in the second century and completed his only surviving work, the three books To Autolycus, sometime after 180. These books defend belief in God as creator and in the resurrection, attack pagan religion, comment on the creation account in Genesis, and present a chronology of the world that is meant to demonstrate the priority of Moses to Homer and the other Greek writers.